If you’ve ever attended Sunday School or Christian education, you likely have heard the Parable of the Prodigal Son. The younger son of a wealthy man wanted to live an adventurous life. So he asked his father for his share of what would be his inheritance when his father eventually died. He took the money and left, going to a far-away country; he spent that money and his resources recklessly and wastefully which is the actual meaning of prodigal. As the money runs out, the country he’s in is going through a famine, and the only job he can find is that of feeding pigs. He barely earns enough money to feed himself and considers eating the pigs’ food. At that point he decides to return home, throw himself on the mercy of his father, beg for forgiveness, and ask his father to hire him as a servant. After walking many long, dusty roads (to the point where his sandals are so worn they barely stay on his feet), he approaches his family home. The father sees him from far off, and, recognizing him, runs to him, and showers him with love and forgiveness. No begging was necessary. There are so many different facets of this story. I could write a dozen posts about this one parable. And that’s what is so wonderful about the parables; they are rich with meaning. Just when we think we have figured out one, there’s another angle to consider. Henri Nouwen (a priest, theologian, professor, and writer who died in 1996), spent hours studying Rembrandt’s painting that represented the prodigal son parable. He then wrote a book titled The Return of the Prodigal Son. 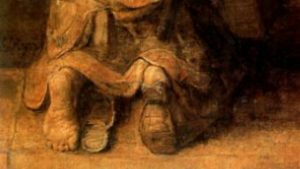 This is a snippet of the son’s feet from Rembrandt’s perspective. When I was studying Nouwen’s work, I kept coming back to those feet. Over and over I would look at them. 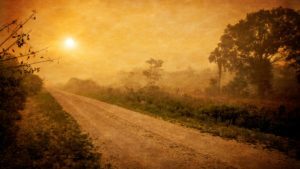 In 2012, four years after my son Tim died, I felt compelled to write about them and how Tim (also a prodigal), might have felt in the son’s sandals. Although this is intensely private, I feel moved to share my concept of Tim putting himself in those shoes at the time of his death. This is me—the child returning home. Feeling unworthy, unloved, and alone. Remembering all those things I did that put me where I am now. Wasting time, wasting money, wasting my life. Living for only what brings excitement and thrills for the day. In my head I plan the words that will soften my father’s heart for me to get back within his good graces even a little. Will he be surprised to see me? Will he even acknowledge my presence or turn his back? I’m so afraid of his reaction because my life has run out of chances. And as I start that final mile home, there in the distance, I see him. I am too broken to walk any faster than my halting steps take me. But here he comes—running in the light, his arms open wide. I kneel before him, my sandals so worn from walking that dusty road alone that they fall off my feet. He pulls me up, his arms folding me into him. Oh Norma, your writing touches me like no other ever had before. So beautifully written and so sad. God Bless you! Once again, Norma, you have put a beautiful concept into beautiful words. The memory of that sad day when we lost Timothy still engulfs me with such sadness, but then I read your words (and cry), and know he is indeed home. Beautifully written, dear sister. To all who were so kind to comment on the Prodigal Son post relating to my son Tim’s life, thank you. I also found Henri Nouwen’s book “The Return of the Prodigal Son” a meaningful read. Thank you for being willing to share about Tim’s death. Yes, indeed, God can do wonders with a broken heart, IF, we give to Him, all of the pieces!!! Norma, again you blow me away with your insight and correlation with Tim’s life. I have tears flowing. I am confident that you are absolutely correct in knowing that God welcomed Tim into his loving embrace. Sending you a big HUG! Love you! Thank you Norma for sharing. I know our sons are both in heaven and we one day will be with them again. Phil’s service was lovely today. And yes, I could feel our boys smiling down on us as we embraced. Remember to take care of yourself in the early days and weeks. When the shock of death wears off, sometimes we end up on autopilot living and forget that we need to be as good to ourselves as we are to others. Rest, even if you can’t sleep. Eat well, even if only a little. And breathe. I am as close as your phone.